Dimension Invasion is a PQ that requires 1 to 4 players, available to levels 140 and up. In this PQ, the objective is to prevent Hilla's troops from taking over Heliseum, but don't expect Magnus to sit back and watch. When you start this party quest, you will be warped to the Interdimensional Battlefield, which is where the first five stages will occur. The main objective is to kill the monsters as fast as you can, because if too many monsters are in the map at once, the monster population bar under the timer will increase too much, leading to failure of the PQ. In each stage, once you completely clear a wave of monsters, the next wave will instantly spawn. However, if you take too long to kill them, the next wave will spawn regardless of whether all monsters have appeared or not. The time between each respawn, in the latter case, gets faster and faster as you advance to the next stage (note, this does not apply to the bonus stages. Once the mobs spawn, the next wave will not appear until ALL mobs have died). The first stage of this PQ will consist of 30 Pikeman Skeleknights and 3 Vanguard Bloodfangs spawning on the bottom. 7 waves of these will spawn, and the stage will be complete. Note: The Bloodfangs have a lot more health than the Skeleknights. Wave spawn interval is about 30 seconds and the population threshold is 50 monsters. In the third stage of this PQ, large crimson Interdimensional Portals will appear in 3 spots, the top left, the bottom middle, and the bottom right. 30 Skeletroopers will randomly spawn from each spot in swarms for 9 waves. The next waves usually do not spawn until all the monsters from the previous one are defeated. This stage can be a problem to low-mobility jobs, since the Skeletroopers respawn faster than the mobs in stage 1. At the 10th wave, all 3 portals will spawn 30 Skeletroopers each, totalling to 90 monsters, so if you have 10 or more monsters remaining by the 9th wave, you might fail. Spawn interval is about 20 seconds and the population threshold is 100 monsters. Before this stage officially starts, there is a brief intermission of about 1 minute or so where Gargoyle Knights will appear from both sides of the map, dropping green meteors onto the battlefield. These meteors are like the green ones encountered when fighting Magnus. They ignore all invincibility frames (minus paladin hyper sacrosanct) and deal 90% of a player's HP. The best way to avoid these is to climb to the top of either side of the map, and wait until all the meteors have dropped (they automatically disappear when the population bar below the timer disappears. When the meteors have dropped, the fourth stage will start. This stage consists of 20 Gargoyles and Gargoyle Knights. The difference between the two is that Gargoyle Knights have more HP, and can stun. There are 30 waves of these monsters. The Gargoyles respawn faster than the mobs in the previous stage, making this stage hard for jobs that can't kill these quickly. Spawn interval is about 5 seconds and the population threshold is 50 monsters. 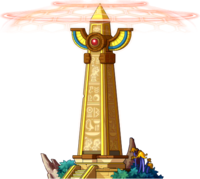 This stage involves destroying the Obelisk Shield. Sounds simple, right? Well, there's a catch: Spearman Skeleknights will spawn continuously during this stage, and cannot be defeated until the Obelisk Shield is destroyed. 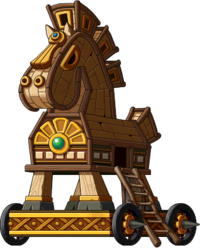 The Obelisk Shield has the same stats as the Large Wooden Horse, but it does not count as a boss. That means that "Damage to Boss Monsters" stat will not be applied and your damage will be noticeably lower. Afterwards, defeat all the Skeleknights to complete this stage. There are 7 waves of Skeleknights, each time having 15 of them. Wave spawn interval is about 10 seconds and the population threshold is 100 monsters (including the Obelisk Shield). You will also receive a Normal Dimensional Drop, which contains potions, Potential/Enhancement Scrolls, Mystery Mastery Books, 30%/70% Scroll for Gloves for Attack, or one of 4 Dimension Glove Pieces. Afterward comes one of three bonus stages, depending on your luck. In this stage, you just have to defeat about 30 hordes of Specter Shieldbearers summoned by Magnus. It mostly serves as bonus EXP. The stage itself gives no experience, but rewards a Psychotic Dimensional Drop, which contains random potions, scrolls, and the Magnus's Pride medal. In this stage, Magnus and Hilla will summon 4 Commander Specters and 4 General Bloodfangs to battle each other for 30 times. Specters appear on the left, and Bloodfangs appear on the right, and will constantly walk toward each other. They have no attacks, but if they touch each other, they will die, so you must kill them to prevent them from doing so. Since they have a fairly large amount of HP, if you're in a party, it's best to split the kills between members. If you're soloing, take advantage of any freezing/stunning/slowing skills you may have. The stage itself gives no experience, but it rewards a Fearful Dimensional Drop, which contains potions, Shadow Merchant Coins, Necro Weapons, Elite Heliseum gear, and the Bold Indifference medal. In this stage, Hilla summons a Giant Darkheart for you to defeat. It proves to be quite the formidable opponent, since it has a lot of health (around 1 billion at Level 180, HP is scaled to level). It starts casting Damage Reflect of about 50,000 damage at 90% health, which lasts 15 seconds and has a cooldown of 80 seconds. It starts casting Zombify at 50% health. 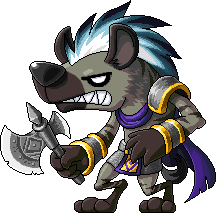 It also summons 31 mini Blackhearts, which also cast Zombify, at 50% health once, and will become invincible until you defeat them all. At 40% health, it starts healing itself for 99 million health around every 30 seconds (can be negated with Wounds Shot debuff effects). The stage itself gives no experience, but rewards a Necromantic Dimensional Drop, which contains random potions, recipes, Nova gear, High Quality Dimension Glove Pieces, and the Hilla's Dignity medal. Note: The monster stats will vary based on the average level of the party. The monsters stats here don't go past 180, even though the stage clear experience continues to increase past 180, up till 200. Appears in the first stage of the PQ. Seven waves of these, along with Vanguard Bloodfangs, appear. Appears in the first stage of the PQ. Seven waves of these, along with Pikeman Skeleknights, appear. Appears in the second stage of the PQ. It can summon 10 Pikeman Skeleknights, which render this boss invulnerable until killed. It can also heal itself for around 1,800,000 HP. Summoned by the Large Wooden Horse. The Large Wooden Horse is invulnerable until all 10 of these are killed. Appears in the third stage of the PQ. Several swarms of these appear. Unless you have good mobility, this stage can be hard. Appears in the fourth stage of the PQ. These respawn quickly, and if you can't kill them fast, it's recommended to party with another person. Same as above, except with the ability to stun, and with slightly higher HP. Appears in the fifth stage of the PQ. This must be destroyed fast, because Spearman Skeleknights will keep spawning and be invincible until this is destroyed. Appears in the fifth stage of the PQ. Summoned in the Hilla Bonus Stage. Be careful, as it can Zombify, Damage Reflect, and do high damage. It can also heal for around 99 million HP. Giant Darkheart summons 31 of these. Giant Darkheart will be invincible until all of these are dead. It can Zombify. Summoned in the Hilla vs. Magnus Bonus Stage. If either of the two touch either other, they will die. Summoned in the Magnus Bonus Stage. These spawn in swarms, and mostly serve to give bonus experience. This page was last edited on 19 February 2018, at 19:14.